Last week my Cubs fanaticism went to an entirely new level. Jen, baby girl, and I went to the 2013 Chicago Cubs Convention. “What on earth is a Cubs convention?” you may ask. Basically, imagine a whole bunch of Trekkies getting together, and then replace Vulcans, Klingons, and Picards with Banks, Williams, Santo, and Sandberg jerseys. Thanks to the generosity of our family at Christmas, we were able to book a room and passes for the Cubs Convention this year in Chicago at the Sheraton Towers (very fancy). Immediately upon our arrival to the hotel, I realized that getting there 2 hours early for check-in was still too late. The entire lobby was teeming with Cubs fans, and the line encircled the entire lobby. Within half an hour of being in line, I had my first crazy-fan-paparazzi moment. As I’m getting near the front doors in the line, in walks Mr. Cub in his suit and fedora. 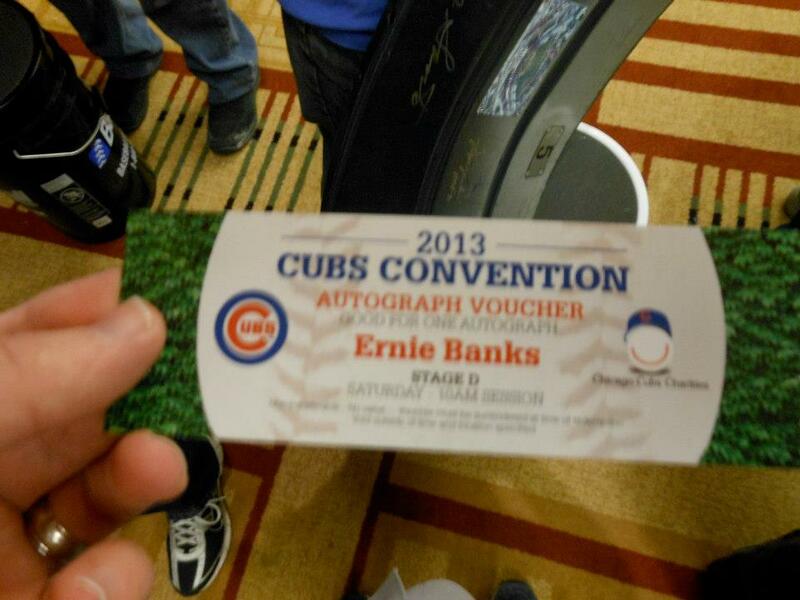 I get super-excited, because Ernie Banks is one of the main reasons I wanted to come to the convention. He seems to be in the midst of conversation, and no one is interrupting him for autographs. So, I surreptitiously took a very-fuzzy cell phone picture. He’s the one with the fedora/halo. I decided that this might be my only shot at meeting him. So, I dug out a baseball and a sharpie from my backpack, but when I looked up, he was gone. I guess for an 81-year-old man, he still has some of that youthful speed. Oh well, I still have a few days. So, I get up to the front desk and meet a really nice associate who hooks us up with a King-size upgrade and a free refrigerator for my baby’s formula/meds. Great day thus far. Shortly thereafter I discover that I parked in a parking garage that the bellhops do not travel to. So, I had the pleasure of making three trips to the parking garage. On our first trip up, Jen and I each have about 3-5 bags and baby girl in her stroller (BTW…when you have a baby, your luggage needs do not increase 33%, more like 300%). As we negotiated our way through a labyrinth of hallways, I bump into another Sheraton employee and ask for directions to the elevator. We must have looked exhausted from our 5 hour drive and long hike with sundry luggage items, because he ushered us into the staff elevator. So here we are, Jen, me, a ton of luggage, a bay in a stroller, and a whole heap of staff people on a staff elevator. On the next floor, the doors open up and in walks Dioner Navarro and his wife. He and I had a moment of me thinking “Dude, you play for the Cubs” and him thinking “Oh crap, I’m stuck on the elevator with a fan,” but then we just exchanged head nods and our wives talked about how cute Lily is. After we got settled into our room, we rested/recovered from our long drive. Then, we made our way down to the Opening Ceremonies of the convention. It was a lot of fun. There was an insane amount of people in Cubs jerseys and a little brass band entertaining the crowd. The Opening Ceremonies began with a video (narrated by Cubs fan Gary Sinise) about the history of the Cubs and where the Cubs are headed under the ownership of the Ricketts family (classy folk). Then, all of the former players, minor-league prospects, and current players present at the convention were announced. 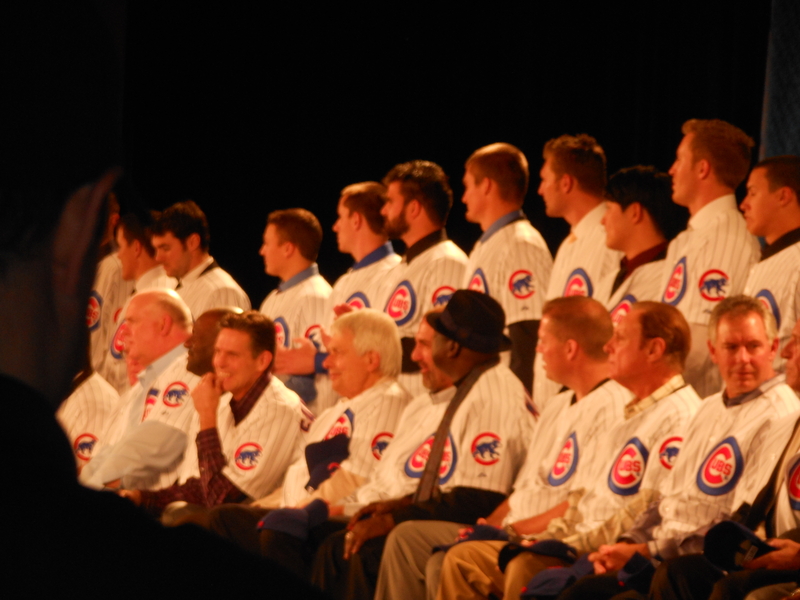 Each player was cheered loudly, but the place practically exploded for Kerry Wood, Ernie Banks, Starlin Castro, Darwin Barney, and Anthony Rizzo. Each player was announced with a short list of their career highlights, which for some guys was a bit of a stretch. Immediately after the Opening Ceremonies, there was an Autograph Hunt. Each fan was given a map of the first four floors of the hotel, and there were little Cubs logos marked for where a player would be signing. There was no indication as to what player would be where, so it was quite a gamble/adventure. We left a little early, picked a line, and waited. Shortly thereafter we realized that we had picked the line of a bench player, and we decided to seek a line with one of the hall-of-famers. Turns out the only Hall-of-Famer signing that night was Fergie Jenkins at his booth. (FYI – if you go to a convention in the future, Fergie Jenkins has a booth supporting his charitable organization, and he – and other former stars including Lee Smith, Gaylord Perry, and Rollie Fingers – sign stuff for a donation to the charity. So, don’t spend Autograph hunt time at his booth, because you can meet any of them all weekend). We didn’t know how this all worked, but he was handing out free signed 8x10s for the autograph hunt. I was very excited to meet Fergie Jenkins and Lee Smith (and so was our baby girl). After meeting these two insanely good pitchers, we wandered around checking out the other lines. Most all the other lines had prospects or former players that I didn’t know much about. We happened to wander back past our original line only to discover that Kerry Wood was signing beside that bench player. We had jumped out of line and missed an opportunity to meet Kerry Wood! ARGH! We got back in line and waited. Kerry signed for an extra 30 minutes, but he had to leave for his charity event that night….when we were about 20 people away. Sadly, Kerry didn’t sign any the rest of the weekend. This is my one regret of the weekend. Following the autograph hunt, we returned to our room to discover that 8:30pm felt like 11:30 pm. We ordered an authentic Chicago pizza from Lou Minalti’s (excellent), and we relaxed in the room the rest of the night – as I schemed about how I could meet Ernie Banks on Saturday. 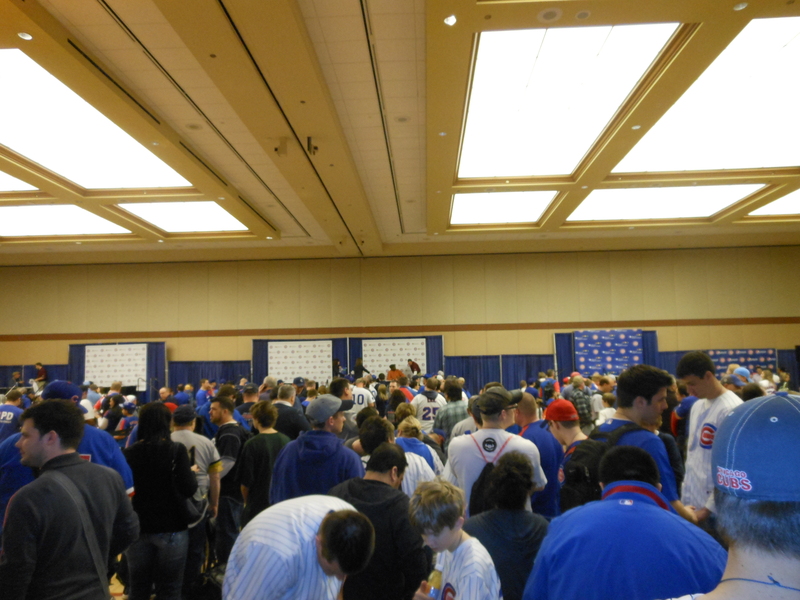 Saturday of the Chicago Cubs Convention consists largely of two things: Autograph lines and Q&A Sessions. Up until this year, there was a lottery system in which you would have a scratch off thing on your pass with the opportunity to get a voucher for a line featuring the best players (e.g., Ernie Banks, Billy Williams, Starlin Castro, etc.). This year, the tried a new system that was supposed to be more efficient and give people a better chance to get autographs. Each person would sign for 1 hour. 10 minutes before he began signing, 125 vouchers would be handed out with those people guaranteed an autograph, but the player would also sign for anyone else after that that would fit in the hour slot. Supposedly, once the vouchers were handed out, the line for the next hour would form and so on and so forth. Thankfully, for me, what this turned out meaning was that if you camped out early enough, you could could be first in line for a later signing. Ernie Banks was supposed to sign from 10:00am-11:00am. Gary Matthews, Sr. was before him form 9:00-10:00. I got in line at 6:45am, and I waited. At about 9:15am I got my voucher to meet Ernie. It was going to happen! I was so excited! Ernie was supposed to sign from 10:00am-11:00am. I did not get to his table, however, until 11:10am – and there were still several voucher holders behind me. He was very kind to everyone he met. He talked with a boy in front of me for a few minutes about golf and showed genuine interest in the boy. As someone who used to be a little boy, I’m sure this will be one of his coolest memories as a young Cubs fan. When I got up to the table, Mr. Cub commented on my beautiful baby that had fallen asleep in her mother’s arms about 15 feet away. He was a true gentleman, who showed kindness and grace to every fan. 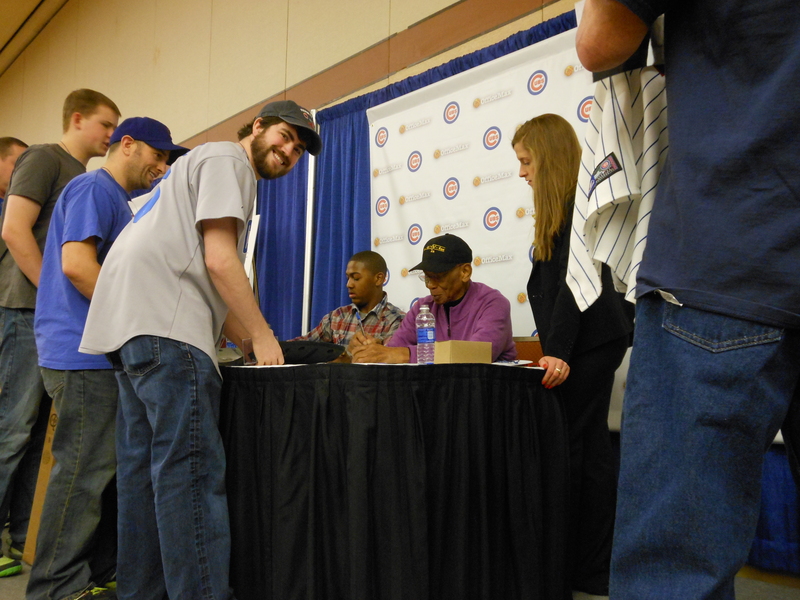 Needless to say, meeting Mr. Cub really made my weekend. Afterwards, we sat in on a Q&A session for a bit with some Cubs draft picks talking about making their way through the minors. Then, we decided to hit the town for lunch/coffee. That night we checked out the various exhibitions in the hotel and spent some time playing with our baby. 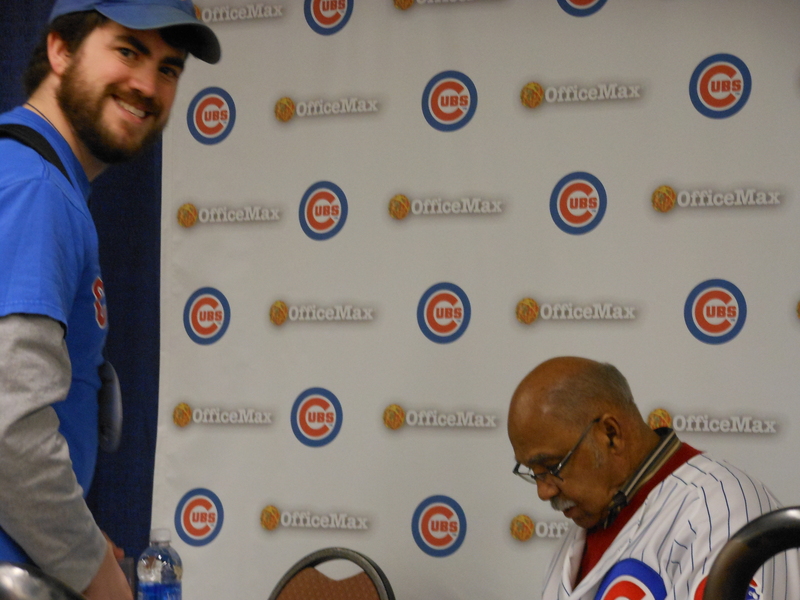 After waiting 4.5 hours in line for Ernie Banks, I decided to get an earlier start on Sunday to meet Billy Williams. Who is Billy Williams? His nickname was “Sweet Swinging Billy Williams,” because he had one of the best swings the sport has ever seen. He was the NL rookie of the year. He won the NL batting title in 1972, and he was an All Star 6 times. I went down to get in line at 5:45am for his 10:00am signing. Ernie Banks was also signing again at 10:00 in the same exhibition hall. I was number 65 in line (apparently some people got there at 2:30am!). People get a little crazy when they are in line for hours on end. At one point someone from the end of the line came over and told the people in the front (that had been there since 2:30am) that they were lined up at the wrong door, and that two sets of doors would be opened at once. I feared a riot would start. People got really agitated, and they hounded every Cubs Convention worker that came near them. Finally, a supervisor came down and gave us the common sense answer: “Of course we’re only going to open the doors where the line starts.” Crisis averted. Thank you dude with the walkie-talkie. The doors opened at 8:00am, and the vast majority of people headed for Ernie. I hurriedly made my way to Billy Williams’s line, and found that I was now number 11 in line. Booyah. By 10:05am, I was talking with Billy Williams. While I was waiting in line for Billy, Jen was able to sleep in a bit. After the girls were rested up, they made their way down to the ballroom and got in the kids-only autograph line to meet Anthony Rizzo. Jen got him to sign a ball for baby girl (and daddy), and we met up after I met Billy. We got to spend some more time walking around the exhibits and talking with people. Then, we got packed up and headed back to the Commonwealth. We had a great time at the Cubs Convention, and I would love to go again. If you are planning on going in the future, here are some pointers. If there is someone you really want to meet (e.g., Ernie Banks, Starlin Castro, Billy Williams), camp out hours in advance. You can bring a book or your iPod. I brought both, but just ended up talking to people the whole time. (This advice is assuming that they don’t reinstate the lottery system). Friday Night Autograph Hunt – Pick a line and stick with it, then jump from line to line (or else you might miss Kerry Wood like me). Also, don’t go for Fergie Jenkins during the autograph hunt. You can get him at his booth almost anytime during the convention. Don’t be that guy. Don’t stand outside the bathroom or the hotel restaurant just waiting on players. Definitely DO NOT follow around any of the players’ wives. That is just weird and creepy, and I saw it a lot. Don’t corner players (or their wives) in elevators and interrogate them. Don’t try to get convention workers to cheat the system for you. Research ahead of time. Know what people look like without their uniforms. You just might run into them in the lobby, but remember – don’t be that guy. Be respectful. The players are people just like you. Show them respect and don’t be creepy. Once again don’t be that guy. Don’t be like the middle school girl that asked me loudly in front of a minor league player: “Who is this?” and then responded with a disgusted “Oohhhhh” when I said he wasn’t Brett Jackson. Awesome Trip! We need to do this one again! !